The Express & Star has revealed today that Dudley Metropolitan Borough Council spent almost £1m on public relations during the last financial year. Taxpayers’ shelled out £945,000 to promote the council’s image to…well…themselves. This included the total wage bill of £680,000 for no less than 18 press officers and £265,000 in running costs. Though this outlay has been criticised as ‘incredible’, the council finance chief has defended it as value for money. The article doesn’t go to great lengths to describe what initiatives this cash has been spent on, but the indication is that a chunk of the cost went towards “a series of ads, posters and leaflets featuring the character of Direct Dave”, which we are informed were “produced and circulated at taxpayers’ expense”. 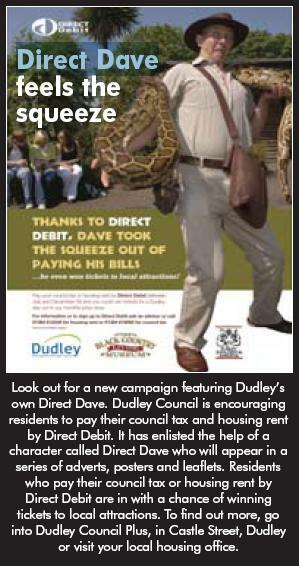 Direct Dave, no doubt hilarious to his creator, seems (bizarrely) to be styled on Crocodile Dundee, and is presumably supposed to give residents a chuckle as they ponder the various ways in which they can pay their ever increasing council tax. And it seems that Dudley are loathe to promote anything without a gimmick, as the article also mentioned the “Don’t Dirty Dudley” campaign – warning that dropping litter or leaving dog mess around will result in a £50 fine – which was launched by television’s Kim & Aggie, who are unlikely to have waved the appearance fee and the what they’d expect to earn from allowing the council to produce a range of promotional literature with their images on it. Plugging “Don’t Dirty Dudley” into Google brings up an old press release from the launch of this enterprise (if you could really call it that) which gives a good idea of what sort lame and pointless PR exercises these 18 press officers are wasting this vast budget on. Apologies to anyone who finds this give-away remotely appealing. What cleaning ladies and books (or indeed small cardboard page-markers) have in common with someone getting a £50 fine for dropping a Twix wrapper or not using a pooper-scoop, is surely now completely unclear to anyone in possession of a rational mind. Regardless of the peculiar characters Dudley Council are using to communicate with their public, there’s little doubt that this is an expensive and elaborate way to express relatively straight-forward public messages. What is more, it’s worrying for residents that the council finance chief would defend this as value for money, and unfortunately this attitude indicates that taxpayers’ in Dudley can look forward to more zany advertising campaigns paid for with council tax money that they, in many cases, can’t really afford to give.